Today, Maine’s highest court ruled that denying a transgender girl the use of the girls’ restroom at her school violated her rights under Maine’s Human Rights Act, which prohibits discrimination against transgender people. The decision in GLAD’s lawsuit Doe v. Clenchy marks the first time a state court has ruled that transgender students must be allowed to use the bathrooms that match who they are. “A transgender girl is a girl and must be treated as such in all respects, including using the girls’ restroom. 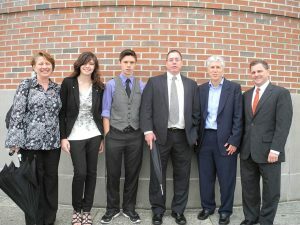 This ruling is consistent with what educators and human rights commissions – including the Maine Human Rights Commission — around the country have concluded,” said GLAD Senior Attorney Bennett Klein, who was co-counsel with Levi in the case. The litigation arose after officials at an Orono elementary school denied Nicole Maines, a transgender girl who was then in fifth grade, use of the girls’ restroom. The school had previously allowed Nicole to use the girls’ room but reversed course after the misconduct of one male student who followed Nicole into that facility. GLAD and Jodi L. Nofsinger of Berman & Simmons, P.A. represented Susan in the lawsuit. Learn more about the case and read previous case documents here.